Career Plans: I will be graduating in the Spring of 2017. I am going to be studying for my LLM (legal masters) in Chinese Law at Renmin University in Beijing, China, beginning in the Fall of 2017. I eventually want to practice in areas of trade law, international business law, and government relations. How did the study abroad program fit with your required coursework? Did you do an independent study? The four-week Chinese Law Summer Program counts for five credits towards your law degree. In that way, it made it a lot easier to justify spending time overseas for a summer because I was earning credit all the same. Additionally, the experience counted towards my International and Comparative Law certificate. There was a final at the end of the four weeks that was just as difficult as an exam back in the Untied States, however, because I was immersed in the culture we were studying about the exam seemed like an opportunity to share what I had learned rather than a ‘test’ in the traditional sense. The furthest I had ever traveled prior to this trip was the United Kingdom – it's different, but you can make your way around with a little help. China was a completely different ballgame. After 17 hours of flights, I arrived in Beijing in a daze. I remember riding the express train from the airport to the law school and just starring out the window at the endless rows of buildings, funny characters, and occasional western establishment such as IKEA amongst the organized chaos that is Beijing. I always enjoy the first moments of a trip. The adrenaline, the small tinge of fear, the complete hopelessness of not being able to read signs; it is probably one of the best parts of traveling because it is at that point that you experience personal growth. Sometime the feeling is more subdued, as was the case in the United Kingdom. Other times, the feeling is in overdrive – as was the case with China. The initial impression was that this was going to be a challenge. But also, this was going to change my life. Did you go on additional excursions? How did you navigate them and how did it affect your experience abroad? The program facilitated optional excursions of which I participated in all of them. We went to the Great Wall, the Summer Palace, Tiananmen Square, and the Forbidden City for cultural field trips. Additionally we went to the Supreme People’s Court (the Supreme Court of China), met with lawyers working with the National People’s Congress (China’s legislative body), the Ministry of Commerce, and a local court to watch a court proceeding. I would have never been able to see so much in such a short period of time without the help of the program. During a free weekend, I explored Beijing with friends – something that really made the experience of studying abroad. Taking a trip – even within the city that you are stationed – without the guidance of a tour guide pushes you to grow in ways that few other experiences can. Did you talk to any locals, if so, what was it like interacting with locals? I do not speak Chinese, which for some may come as a surprise as I did spend two weeks in a Chinese law firm assisting in legal work. The truth is that much of business, especially international business, is done through a collaboration of lawyers, all of whom are speaking many different languages. As such, I had the privilege of working with lawyers who spoke English as either a native or a secondary language and never felt that I was not able to fit in to the firm culture. In many ways, having to be thoughtful about language differences helped me to be more purposeful in the language I was using on projects as simple as an intern manual for those students who will be interning after me, to things as complex as a drafting an international business contract. Communicating outside of the office, however, was more of a challenge. While I often had the benefit of a classmate that spoke Chinese, and my partner who speaks fluent Mandarin visited for a week, there were times that I was on my own. It can be overwhelming, and there were some moments where I chose a grocery store meal over going out to eat because I was exhausted after a long day’s work. Although, one could argue that the same happens here in the States! What are some aspect of culture, customs, food, religion, way of life, etc. that were an adjustment for you? What did you learn from them? China can be extremely overwhelming. The sights, smells, and language are so foreign to most Westerners and in that respect, spending time in China can be a huge challenge requiring adjustment for even a seasoned traveller. However, China provides an intoxicating experience that will leave you wanting for more. It was in the quite morning Tai Chi in the park next to my hotel that I fell in love with the Chinese way of focusing at the beginning of the day. It was eating food from a stall on the street on a late weeknight in June - lights flashing from street signs, people everywhere, and every smell you could imagine wafting in the air – that I fell in love with the hustle and bustle of life in Beijing. It was in the deafening silence of a Buddhist temple in Bai Hai Park that I came to respect Buddhism in a way never taught in the United States. And it was in interactions with the people going about their day-to-day lives in Beijing that I came to appreciate the similarities between Chinese people and myself. Did this trip reaffirm your career goals? Did it change them? What skills did you learn on the trip that will help you? What would you tell an IUPUI student looking to study abroad? What was the main convincing factor for you to go? One word: go. Vacations are nice, but being able to live in a foreign country is a completely different experience and one that you will not soon regret. 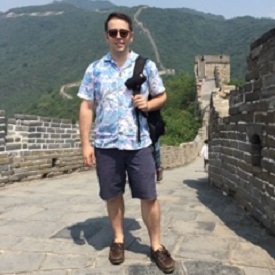 I was looking for a little adventure and that was the motivating factor in wanting to spend six weeks of my summer in China, but everyone in the program had his or her own reason for wanting to participate. For some it was a test of their ability to go outside of their comfort-zone. For others, it was an opportunity to explore a country that they would never have chosen otherwise. Whatever the reason – it is a valid one. Will it be a challenge? Absolutely. My time in China had moments where I would question why I had travelled halfway across the globe. However, those moments were always followed with a memory that showed me exactly why I had made the decision to board a plane for Beijing two weeks after finals had concluded. If you haven’t been abroad, if you are scared of traveling that far from loved ones, if you are nervous about going to a non-English speaking country have no fear! It will work out, you will have a blast, and you will not look back and wish you had not. If you are thinking about studying abroad, allow me to make the final plea: do it, you will not regret it. I certainly did not – it changed my life! How did studying abroad influence your experience at IUPUI? What do you think you gained from studying abroad? I can definitely say that this program changed my life. As a direct result of my participation, I have applied, have been accepted, and will attend Renmin University, our host school for the program, in the Fall of 2017 to study for an LLM. One of the benefits of the program in my opinion is that it opens the door for thinking about what a lawyer can do to make a difference in their community in ways that may not have been apparent beforehand. It has influenced the courses I have taken since coming back from the trip; it has influenced how I manage my time, and even how I interact with my classmates. It truly is a perspective shift – one for the better.